It is too late to write much but this is one of the most amazing World Series games that I have ever witnessed. The Cardinals down by 2 in the 9th inning and down to their last strike tie it when David Freese hammered a two out triple. Then in the 10th Rangers’ star Josh Hamilton hit his first home run of the playoffs to give the Rangers another two run lead in the top of the 10th. The Cardinals came back again, the Rangers had them down to their last strike but native Texan Lance Berkman hit a single to tie the game. The Rangers twice had the Cardinals down to their final strike and could not put the Redbirds away. In the bottom of the 11th David Freese came to the plate to lead off the inning against Mark Lowe. The St Louis native who had given up baseball at the end of high school and rededicated himself to the game came had hit four post season home runs. In the 5th inning he dropped a pop up at third base which led to a Rangers run. 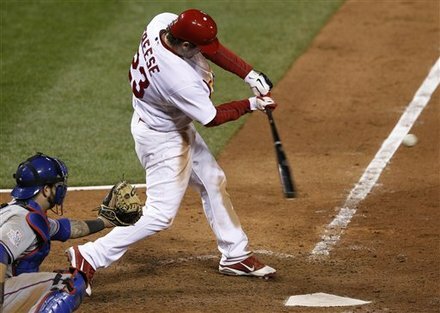 But in then in the bottom of the 9th with the season riding on it Freese hit the triple that tied the game. Lowe got two strikes on Freese and then lightning stuck. Freese hammered the next pitch over the center field wall. This was one of the most amazing baseball games that I have ever seen. The first 6 innings were marred by 5 errors but the game changed and became what will be called an epic game. I will write more on this before game seven because there is so much more to say. Holy Cow! I’m way behind things, so I’ll look for your next write-up. Have a good weekend, and enjoy #7!